New York farmers are still rescuing tender, mildly sweet Savoy cabbages—which are hardy enough to withstand extreme, East River-freezing temperatures—from beneath layers of frost and snow. So when better to try El Quinto Pino chef Alex Raij’s simple recipe for trinxat, a kind of Catalan potato-and-cabbage cake, cheerfully topped with “floppy” bacon? (A high-class version of a diner’s hash-brown plate, if you will.) Look for the crinkly leafed vegetable at Greenmarket’s Northshire Farm. Peel potatoes, and bring to a simmer in salted water. Cook until tender (about 9 minutes). While potatoes are cooking, swish 6 of the bacon slices in the water, shabu-shabu style, for 20 to 30 seconds to blanch gently, and set aside. Remove potatoes from water with a spider or slotted spoon, reserving water. Rest potatoes, and smash fine in a large bowl with a ricer or fork. Halve cabbage. 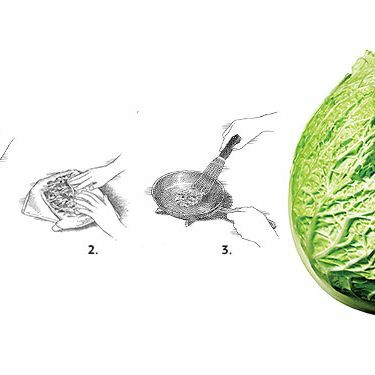 (1) Cut outer green leaves in thin ribbons; cut half of the remaining cabbage in the same way (set aside the rest for another use). Return potato water to a rolling boil, and cook cabbage until tender. Strain, and (2) dry on a paper-towel-lined plate. Chop the remaining slice of bacon. In a nonstick or enamel pan, sweat the chopped bacon until cooked. Add the garlic and the 1/2 cup oil, and cook while stirring until garlic is golden. Pour the garlic-oil mixture directly over the potatoes. Add the dry cabbage, and mix together. Season with salt. Shape the mixture into patties (or a big tortilla-style disk). Heat the remaining tablespoon of oil in a nonstick pan, and (3) brown the cakes on both sides. Cook the bacon slices in the pan on one side only, and serve on top of the trinxat cakes. Serves 6.